Perfect bites for a meal or appetizer! Substitute ground turkey to make it more lean. In a large mixing bowl, stir together bran cereal, ground beef (turkey), onion, garlic, salt, pepper and egg whites until combined. Using a level tablespoon measure, portion meat mixture into balls, place on foil-lined shallow baking pan. Bake for 12 minutes or until browned. Remove onto paper towels to absorb any grease. In a large saucepan, combine ketchup, grape jelly, Worcestershire sauce, Dijon mustard and cayenne pepper. Bring to a boil, stirring frequently. Place hot meatballs in sauce and simmer 5 minutes. 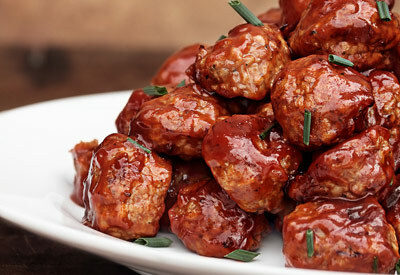 Remove meatballs from sauce and arrange on a serving platter.